Today is Sunday and The Prospero’s are going to take a field trip to the park. Baby Forbes wakes up Rosabelle and Pawel at 4am. Rosabelle feeds and changes him. Pawel heads to the kitchen to start breakfast (§10). There is one of the paintings Rosabelle painted at the museum yesterday. 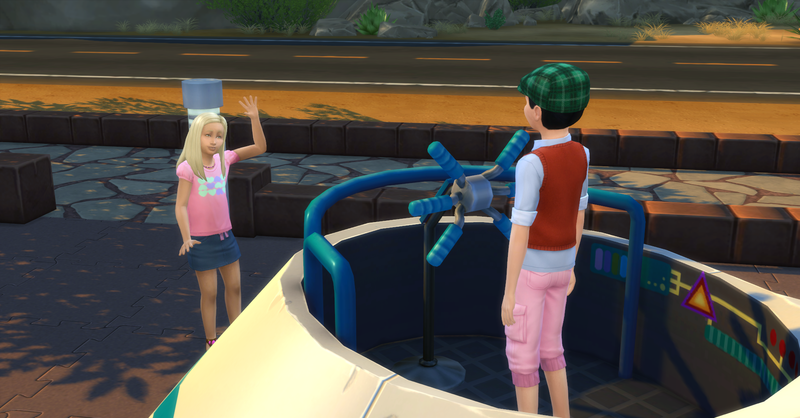 Their funds are now §73,109 simoleons. When he is done, he grabs a serving while Rosabelle works on her book. Pawel looks like he is checking out the second painting Rosabelle created at the museum. Then they switch since there is only one working computer so Pawel can finish his work task for today. Rosabelle tends the garden and evolves the oldest blackberry bush to superb quality. Fortuna has woken up and Rosabelle comes back inside to breast feed the baby because he is hungry and crying (again). 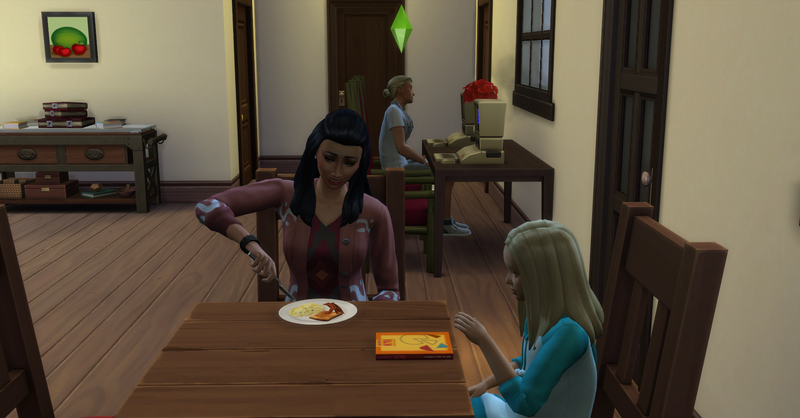 Then she joins Fortuna at the table and eats breakfast while Fortuna works on her extra credit work for school. 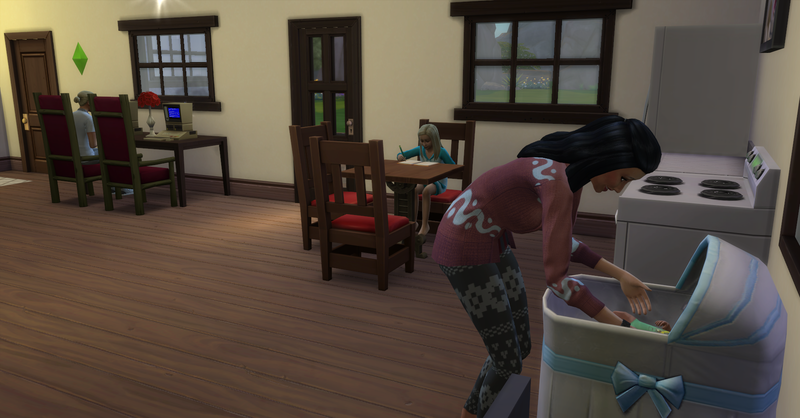 The toilet is nasty so Rosabelle cleans it after breakfast. After cleaning, Rosabelle calls to take Family Leave again today. 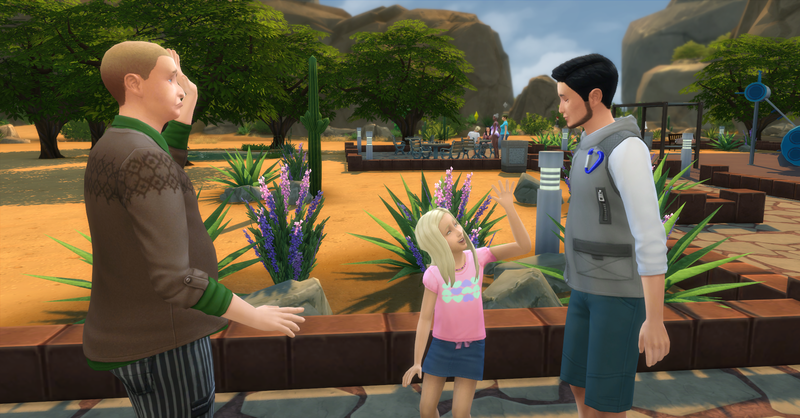 Today’s Royalty Report arrives and they earned §6201, their funds are now §79,310 simoleons. Fortuna’s new childhood aspiration is to be a Social Butterfly, so she needs to meet 5 new friends. 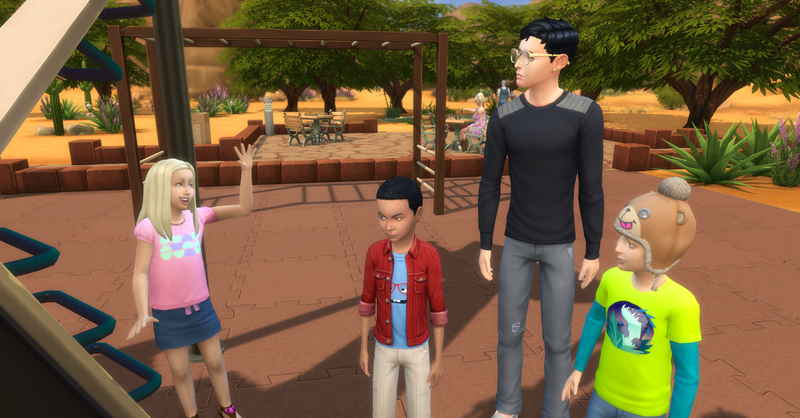 Rosabelle and Pawel decide to take her to the big park in Oasis Spring, Desert Bloom Park & Pool, so she can meet some new people. 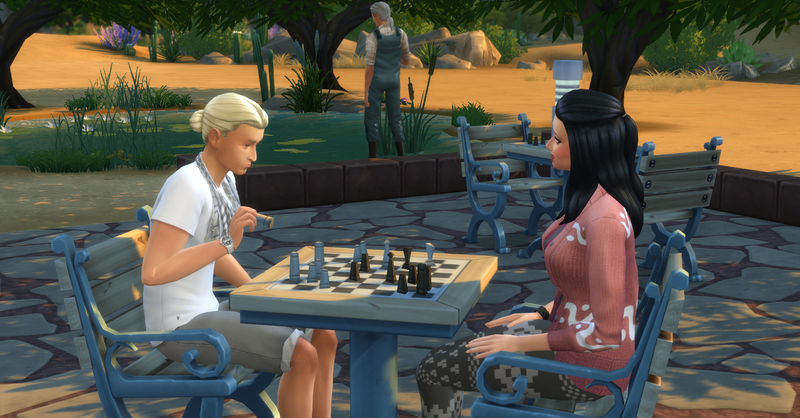 Once they arrive, Rosabelle and Pawel play chess near the playground where Fortuna is playing. The first person Fortuna meets is Karlee Kirkpartick. She is actually the daughter of the doctor who delivered her and her brother. Then she meets Eugene Parrish. 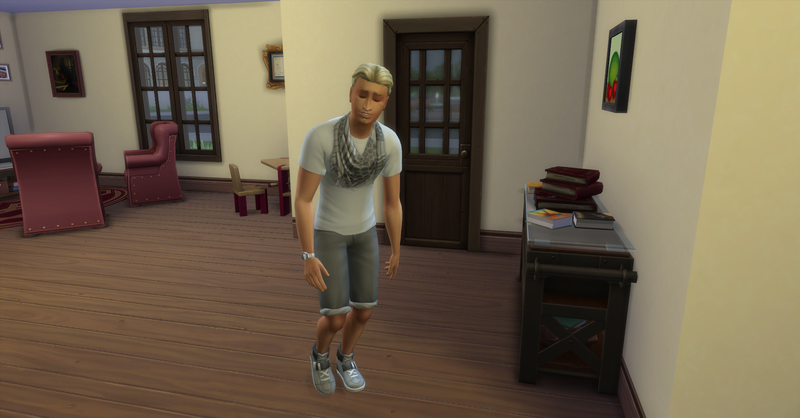 And Karlee’s older brother Jayden, who is a teen. 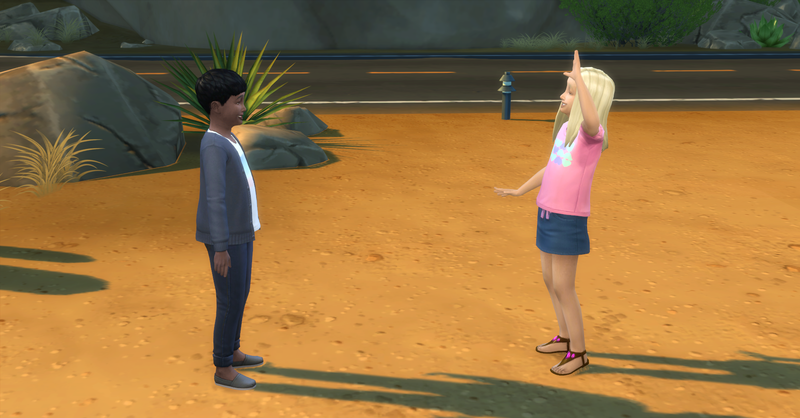 She also meets an adult, Zachary Burt who joins her conversation with Jayden. Fortuna has now completed the first part of her aspiration, she goes back to play on the jungle gym for a while before they need to go home. Pawel comes over and plays Space Monster with Fortuna and the other kids before leaving for work. Fortuna looks very confident here. Rrrrraaarrrr, the Space Monster is coming for you. Rosabelle also plays Space Monster. As Fortuna was saying bye to all her new friends at the Park, a teenager rudely walks through their conversation. It is Alexander Goth! Fortuna introduces herself to him because despite the teenage rudeness, she finds him strangely attractive. Rosabelle and Fortuna head home from the park since it is now afternoon. 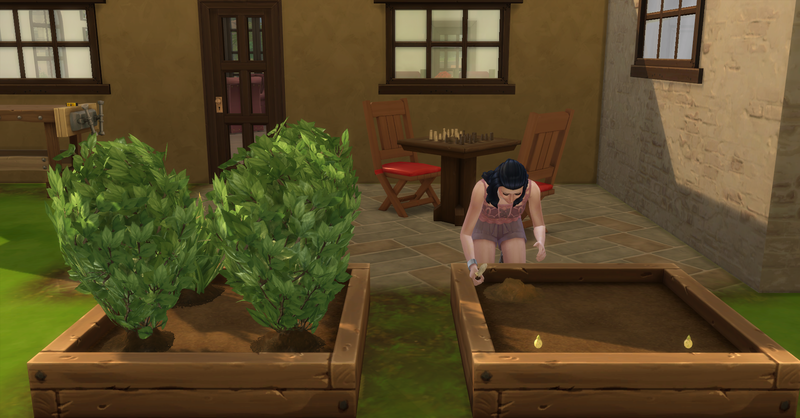 Rosabelle tends the garden and plants some more dragon fruits which she just harvested. Meanwhile, Fortuna is such a great kid! She cleans up the house. 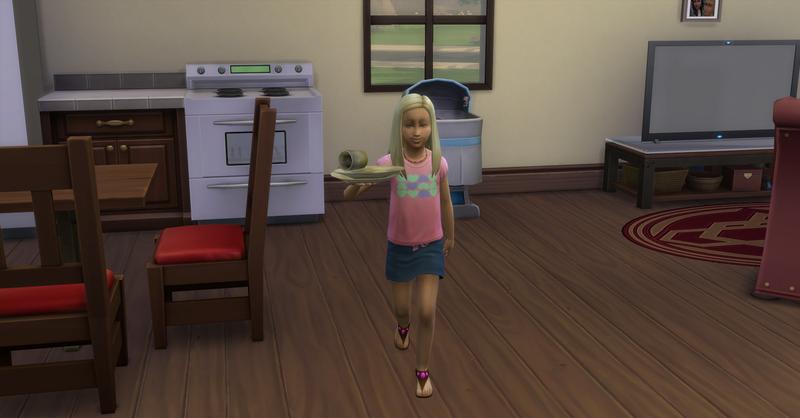 Rosabelle sells 3 strawberries she harvested for §24 simoleons. Then she tries her hand at crafting on the woodworking table. 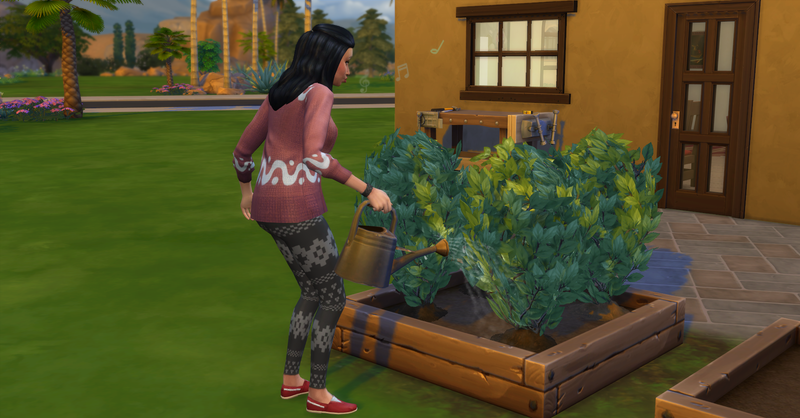 She makes 2 garden pots for §15 each, their funds are now §79,304 simoleons. Unfortunately she is not nearly as skilled as Pawel in crafting and it shows. After gardening Rosabelle eats dinner while Fortuna chats with some friends online. 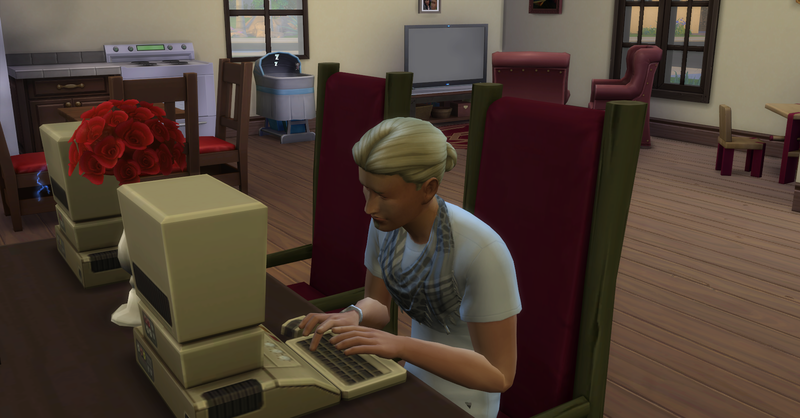 Rosabelle earns §805 simoleons today for family leave and Pawel got promoted to Novelist. 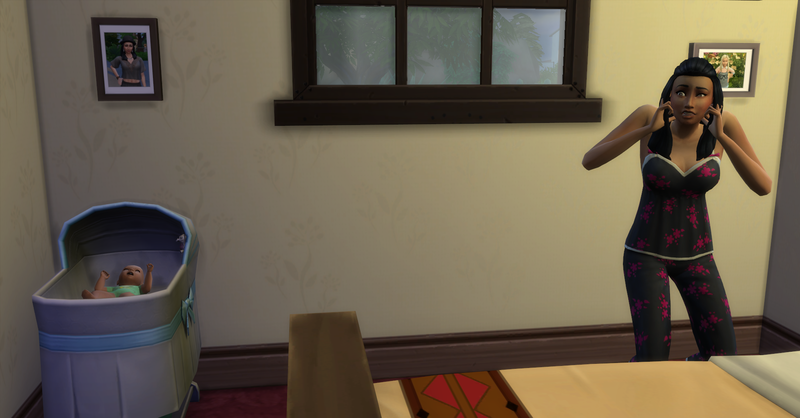 He earned §480 in regular pay and a cash bonus of §1243, their funds are now §81,832 simoleons. Pawel arrives home from work exhausted but happy from his promotion. He goes straight to bed. Fortuna also goes to bed since it is her bed time and Rosabelle stays up to tend the garden and evolve the snapdragon to great quality and the spliced lily, snapdragon and orchid plant to excellent quality. 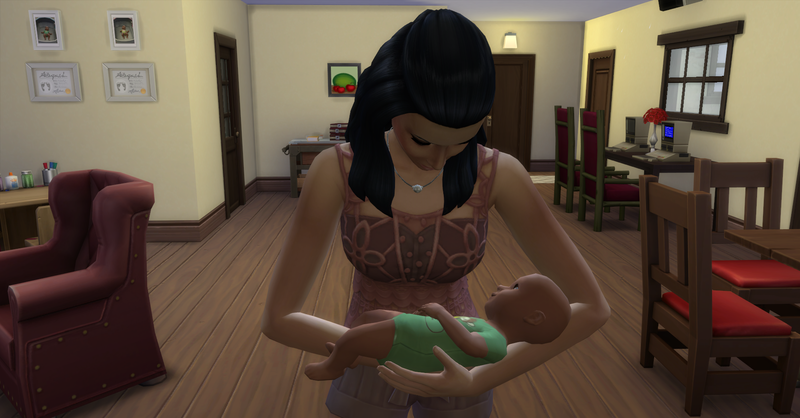 Baby Forbes was crying when she came back inside from gardening. She feeds him and rocks him to sleep. She is also feeling tired and heads to bed. Fortuna is so adorable. I love how friendly she was at the park. I wonder if a certain Goth is in her future to date? I wonder too! He did grow up quite cute and it was totally a chance encounter! That’s so cool that Fortuna met the daughter of the doctor who delivered her, at the park. I know right? 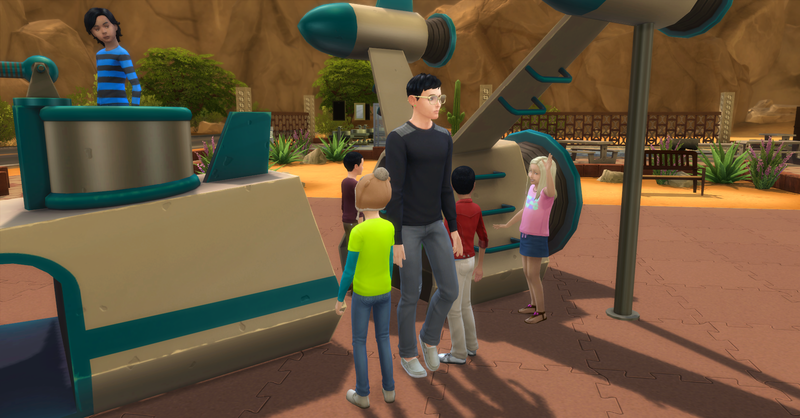 The Sims 4 is much better in terms of townies in my opinion.